January | 2010 | Living with Motor Neurone Disease - One Day at a Time! I’m still fuming over the way my first planning application was handled and the lack of follow up leading to an appeal. I’m far from happy about the solution being proposed and how it will affect my quality of life. I’m absolutely convinced that the side extension is the way to go but having received some feedback yesterday from In Touch about how long it would take to appeal and my chances of success, I am also conscious of wasting too much time. But before I give up altogether there are a couple of things I want to try. One is to try and meet with the case officer in the planning department to try and put my case forward on the grounds of health. The other is to try and elicit the help of my local MP. Below is a copy of the letter that I seem to have spent half the day writing. It will be interesting to see what kind of response I get. To be honest I don’t hold out much hope but I do feel that at times we need to challenge the decisions we are given and not just except them if we know that they are not in our best interest. Hello, my name is Mark and I have a terminal illness called motor neurone disease which is spreading through my body wasting the muscle tissue away and leaving me paralysed. I have been living with this awful disease for almost 3 years now. In that time it has totally destroyed the life I had: I’ve had to give up work at Eli Lilly which I loved as well as give up driving. These days I am almost completely dependent on a team of carers to look after me. Even this letter is being dictated using speech recognition software as I can no longer use my hands for anything. Last year the disease reached a point where it became obvious I would not be able to get up and down the stairs. In conjunction with my OT various options were looked at and it was decided that a downstairs bedroom and bathroom would give me everything that I needed and allow me to continue living in my house. A planning application was submitted last year to build a single-storey side extension to the house that would utilise the narrow strip of garden. The planning application has been refused on the grounds that if they allowed this one to go through it would set a precedent for all corner houses. There is also mention of wishing to keep the open spaces on the estate. However to my mind an open space is what I have directly in front of the house i.e. a playing field with swings, and not my tiny strip of garden. If there is such an objection to building close to the pavement then I would point out that the house opposite me, has its front door almost on the pavement – and this is a huge house! I’m being told by In Touch, the company project managing the extension, as appointed by the Council, that an appeal could take up to 12 weeks and has only in their opinion a 20% chance of success. My health in recent weeks has continued to decline to the point where my legs are so unreliable that I can barely walk to the bathroom (I already took a fall late last year that put me into hospital because my stairlift was not completed in time). I am now trapped in the upstairs of my house and cannot even go out for fresh air as using the stairlift (which was only ever seen as a temporary solution until the extension was built) has become too risky. I desperately need to get the extension built so that I have full access to all the amenities I need on one floor as well as easy access out of the house which at the moment is going to be very difficult for medical appointments. Is there any way that you might be able to intervene on my behalf to either overturn the rejection or expedite an appeal? Because MND is a progressive disease I do not have the luxury of waiting 12 weeks for a decision especially if the chances are only 20%. My need for this extension is on the grounds of health and a desire to preserve some small quality-of-life whilst I’m still here. I do not wish to spend the remainder of my life trapped upstairs; one month has been bad enough. I feel that my request is far from being unreasonable. My neighbours are completely sympathetic to my needs and have no objections to the extension being built. In fact it’s interesting to note that according to the planning website not a single objection was raised and yet I’m still being prevented from building quite a small structure on my own ground which I own outright. The extension does not block anybody’s view, cast a shadow on anybody’s ground, or create a blind spot. I already have a brick wall running parallel to the pavement that closes off my garden so it is hard to see why there should be any objection to basically continuing that only a bit higher. There is a drain cover adjacent to the patio (apparently there is a drop of something like 9 feet into a sewer) that would end up situated in the new extension. I would feel very uncomfortable knowing that there is a sewer cover so close to my bed especially if you can hear running water as you can at the moment when standing on the patio. There would also be the concern of smell seepage. And of course there would still need to be some form of inspection cover in case access was ever needed. The rear extension would swallow up virtually all the garden, creating spots which are inaccessible for maintenance whilst the remainder could no longer be seen either from the extension or the dining room. Because my mobility is so limited and because I used to enjoy the outdoors and my garden so much, being able to sit on the patio in my wheelchair is one of the few pleasures I have left. Losing the garden would deprive me of further quality-of-life. A rear extension would block off most of the light coming into the dining room creating a very dingy atmosphere. It is this area that I would have to spend most of my day working on my computer but without the patio windows to look out of it would be a very dull and depressing work environment. I want to be able to continue to look out of my patio window and enjoy looking at the garden, the trees, the sky etc. I’m also being told that building foundations over such a deep drain would not be easy or cheap. Presumably it would also impact construction time. It is for all of these reasons that the side extension was chosen in the first place as the best and most logical place for a small bathroom and bedroom. My OT and health care professional team are all in complete agreement with me. Because time is limited I feel under pressure to go for this second solution even though I really don’t want it as I know I’m going to feel very depressed with what I will have to give up. But before that happens I really wanted to approach you first to see if you would be able to please intervene in some capacity in the hope that you may be able to get the planners to appreciate the health needs associated with this request and not just process it as a straightforward planning application. Would it be too much to ask if you could please look into this matter at the earliest opportunity because unfortunately with MND time is everything. Thank you for spending the time to read my letter. I had a gaggle of girls descend on me today – well, five to be exact! Marion, my OT, and Elaine, an expert in lifting and handling techniques called round this morning to demonstrate to some of my carers the hoisting equipment that had so far been delivered. First up was a look at the mobile hoist in my study and how it would be used to transfer me from the glide about chair into my high backed office chair. I must admit it felt quite strange dangling from a hoist suspended only in a fabric sling. It wasn’t long before I felt a little song coming on ‘hanging around, nothing to do but frown, rainy days in Monday’s always get me down!’ Ann, Vanessa, and Debbie could only look on in embarrassment and shake their heads, he he. All joking aside though today was of course just a dry run through but I shudder at the thought that one day before too long being hoisted around from one place to another like a sack of meat will become an everyday occurrence. One thing we did pick up during this manoeuvre was how difficult it was to position the mobile hoist when it was on thick carpet and underlay. Apart from that it should be possible to get me into my working environment each day although it’s not going to be a five-minute job. Next up was a look at the goalpost hoist and transfers from the bed to the glide about chair and it soon became apparent that the folks from equipment services who had fitted it had actually positioned it too far forward of the wall at the pillow end which will make transfers difficult. They are going to have to come back and move it about 12 inches. Well it’s better to get these sorts of problems identified and rectified ahead of actual need rather than find out on the day is needed. Lastly Elaine and Marion took a look at the feasibility of transfers on and off the stairlift from the glide about chair at the top of the landing. One thing we cannot use is the mobile hoist as the feet are too wide to pass through the study door way onto the landing now that the stairlift track has been extended. One option would have been to use a transfer board but Elaine seems to be of the opinion that the manoeuvre is too risky particularly as I lose further strength in my upper body. Basically I’d be trying to slide across from one chair to another with the stairwell behind me. If I was to tip backwards I would not be able to stop myself falling. Obviously I couldn’t do this on my own and would need the help of carers but even so it is still deemed a risky manoeuvre. So for the time being anyway it looks like I’ll be spending my time upstairs. At least I have all the amenities I need i.e. bedroom, bathroom and study, so in that respect it’s a bit like living in an apartment although I wouldn’t of course want to live permanently like this. It’s also going to be something of a problem when I do actually need to leave the house for medical appointments. And in the meantime it’s not particularly well set up if I ever receive more than one guest at a time as my study is limited on space. Margaret (my Physiotherapist) and Chris (my PCT Occupational Therapist) called in late this morning with a new neck support for me to try. Previously I had been experimenting with something called a headmaster’s collar but I had found it to be too restrictive due to its rigidity, making it difficult for me to lower my upper body when trying to look down. Also I found that after a short while it became uncomfortable to wear and would hurt my chest. The people at Salts Techstep have taken a fresh look at the problem of supporting the neck muscles and come up with the Oxford Collar, a design specifically engineered for people with MND. As you can see from their webpage here it does look rather strange. At first I had my reservations about its effectiveness but this seems to be one of those occasions where looks are deceiving. For a start it is very lightweight and for the times when the chin isn’t actually resting on the chin pad you would hardly know it is there. Even when the head falls forward so that it is being supported by the chin pad it appears to be far more comfortable than previous designs I have looked at. A lot of this is due to the wire sprung design and to the padded vertical supports which evenly distribute the load so there is no painful pressure point on my chest. They’ve left it with me to trial and have asked me to give them some feedback as it’s the first one they’ve ordered. I had another delivery from Equipment Services this morning. 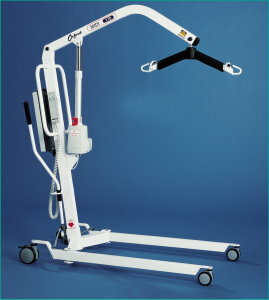 Today they delivered a mobile hoist for the study (see photo below). The purpose of this piece of kit will be to help transfer me into my office chair from my glide about chair if my legs fail altogether. At the moment it’s just sitting in the corner of my study behind me and out of the way, but it’s nice to know that Marion, my OT, has done her usual good job and arranged for equipment to be delivered in a timely fashion ahead of actual need. My carers are relieved that it is an electric hoist and not a manual one as it will make life easier for them. So that’s two down and one to go. Just waiting now to see what happens with regards to the ceiling track in the bathroom which will allow access to the bath lift. I’ve been told by my OT that the equipment stores are not going to fund it so she is looking elsewhere for help. I was just thinking… With all this hoisting equipment my house is going to start resembling a loading bay! I had the first meeting of the year with my GP today. Quite a lot has been happening in recent weeks so predictably there was a lot to talk about to bring her up to speed and to seek her advice on. We touched on a whole range of subjects from muscular aches and pains, dwindling appetite, skin condition, and intermittent constipation (of all things!) which I suspect is being brought on by reduced mobility. And at the request of my senior carer she is now going to start prescribing E45 cream and Sudocrem to protect the skin. Received a letter from the council today and guess what it contained? Yup, approval has been granted on my planning application! But just to be clear on this, it’s the second application, the one to the rear of the house. I must admit (and this might seem ungrateful) that I read the letter with mixed feelings. Why? Because of all the disadvantages associated with it such as losing most of the back garden, reducing the light in the dining/living room and removing the view I have at the moment out onto my garden, as well as ending up with an inspection cover in the wet room for the drain which lies beneath. But beggars can’t be choosers and the main thing is that I at least now have permission to build a ground floor bedroom and bathroom which will eventually make life a lot easier (although having no garden to enjoy). I’m just slightly annoyed that all the help given by the healthcare professionals to add their weight to the second planning application couldn’t have done so the first time round. Given the time constraints we’re under it seems unlikely that we would now spend further time and money on an appeal with an uncertain outcome when we already have what we need. Anyway the next step will be to contact a number of builders on the approved register and have them tender bids and then it will be a case of waiting on the council to determine who will get the contract based on price and availability to start. The snow is starting to thaw at last, temperatures are now up to a quite toasty 0°C or thereabouts, tarmac is starting to make a reappearance and my carers are able to start driving up to the house once again instead of leaving their cars a safe distance and walking the rest of the way. I really wish I had some pictures to post of the snow outside the house but unfortunately my complex looking camera frightens most of my carers off! I had a delivery from Equipment Services this afternoon whilst Vanessa was feeding me my dinner. They had come to fit a goalpost hoist system in my bedroom. It took about 30 minutes for the two guys to assemble all the pieces. As the name suggests it resembles a goalpost i.e. two uprights and a cross beam that straddles the bed. The hoist mechanism travels along the cross beam which extends out beyond one side of the bed sufficiently so that I can be hoisted out of the bed and lowered onto a glide about chair which is then rolled into the bathroom. At the moment it’s just been set up ready for when we actually need to use it. Marion, my OT, will be coming out to demonstrate it soon. So there we are the first piece of equipment ready for when my legs fail completely is already in place and depressing as it is to think of I am at the same time very grateful that Adult Services responded so quickly. Rachel phoned up this afternoon with the good news that funding has been approved for my new hours. The intention is that we’ll be moving from four short calls each day to 2 blocks of time: a morning/lunchtime session and an afternoon/evening session. Resourcing for this is still being looked at but the plan is to start the new hours at the start of next month. The increased hours will allow more flexibility in what I do and when I do it whilst at the same time making things safer for me. However I am being told that because the package is now quite expensive this will most likely be the last time we can increase it using day care rates. So if I start to have a need for care in the night I will probably have to consider having a live-in carer. I had a visit from the planning officer today who had called round to take a look at my back garden as part of the process to determine suitability of my planning application. Not sure how much he’d see considering it was ankle deep in snow! This may or may not work to my advantage as the snow was hiding the inspection cover for the drain just off the patio (in what will end up as the wet room)! I suppose beggars can’t be choosers and I should at least be grateful that I have a second site that could potentially be built on but I just cannot work up the same enthusiasm for this second planning application because of all the disadvantages associated with it. I’m still annoyed I was refused planning permission to build on the side of my own house, and even more annoyed when I found out this week that the appeal had not even been started yet because the council had not made all the necessary documentation available until Christmas week. All efforts are now being concentrated on the second application which I’m told they hope to reach a decision on within about three weeks. I guess now they’ll wait and see what the outcome of this one is and then decide on how to appeal.